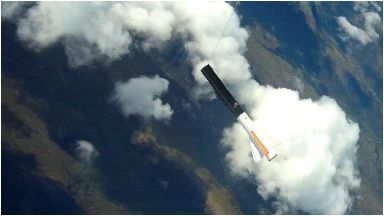 Skyrora saw its 2.5 metre projectile reach altitudes of four miles after taking off in Ross-shire. Known as Skylark Nano, it accelerated to Mach 1.45 - more than 1110mph. "We will use the lessons learned in the next stage of our test launch programme, where we'll be going to a far more significant altitude. "For us it's all about taking careful steps to de-risk and gain experience as we quickly evolve through sub-orbital tests towards our future orbital launch ambitions." The planned £17.2m spaceport will be developed by Highlands and Islands Enterprise. Last month it was announced the UK Space Agency would provide £31.5m of funding for the overall project. Scotland has been described as the best place in the UK to reach in-demand satellite orbits with vertically launched rockets. It is estimated the spaceport could create 400 jobs in the area. Around 2000 satellites are forecast to launch there between 2021 and 2030.